Andis Home & Contents Auction — Harritt Group, Inc.
Scenic drive atop Moser Knobs just minutes to downtown with 1950’s ranch home with addition, enclosed sunroom and two detached garages on 2.5 acres. Also selling entire contents including truck, motorcycles, trailers, tractor, implements, mowers, tools, furniture, appliances, antiques & collectibles. 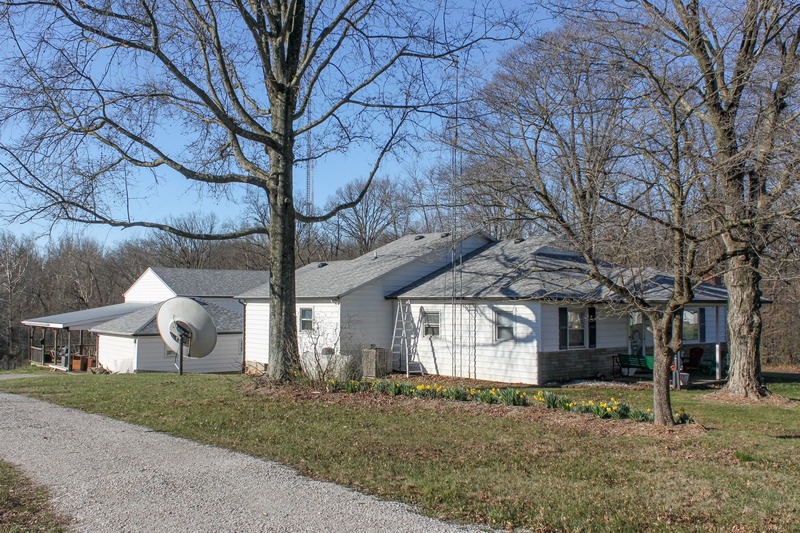 Located on scenic Skyline Drive in Floyd County a 1700 square foot ranch home built in 1958 with private master suite and basement addition, detached 18’x22’ garage and 28’x36’ detached garage with loft and attached carport. Home features 3 bedrooms including master suite with walk-in cedar closet, 2 full baths, large laundry-mud room, tile floors, gas heat & central air, 12’x20’ enclosed sunroom and 24’x24’ unfinished basement with outside entrance. Great potential and buying opportunity with open side lot, circular drive, lots of garage space and plenty of parking. 1995 Chevrolet 2500 Silverado 4×4 longbed pickup truck with extended cab 5.7L V8 gasoline engine 75,881 miles and 1994 single axle tilt 8’ utility trailer. 2009 Yamaha 1300 V-Twin Royal Star fully dressed motorcycle 42,597 miles, 1977 GS750 Suzuki 4 stroke motorcycle 29,468 miles, Kawasaki V-Twin 700 ATV & pull behind cargo-gear trailer. Cub Cadet 7194 utility 4WD tractor 388 hours, Bobcat ZT219 zero turn lawn mower 326 hours, Cub Cadet push mower, Redmax straight shaft weedeater, Snapper commercial weedeater, 3 pt. grader blade, boom, brush hog, scoop & carry all. Iron Mountain combination gun safe. Husqvarna 346XP chainsaw, Delta & Craftsman miter saws, dust collector, Craftsman table with router, Craftsman air compressor, DeWalt portable planer, belt sander, DeWalt 7770 radial arm saw, Ryobi 10” table saw, router, Husky rolling tool chest, Gorilla & Werner ladders, seeder, saw horses, reel mower, large selection of loaded toolboxes, hand, power and yard tools, Ridgid band & scroll saws, Ridgid & Porter Cable air nailers, tap and die set, router bits, lumber rollers, electric hedge trimmer, handyman knee pads, lineman rope, Johnson 9.9hp boat motor and much more in the contents of 2 garages. Vintage nautical door table, Dazey, Dandy & Holt Lyon butter churns and others, Meltor thread cabinet, 1800’s arrow back rocker, washtubs, sprinkling cans and more, army helmet, large selection of pink & green depression glass, carnival glass, stoneware, vintage colorful metal cups, ET & Little Rascal collectible glasses, Eveslage, Purity Maid and other milk bottles, Vintage Old Fitzgerald Bourbon, milk cans, Griswold iron skillets, cast cookware, Jack Correll Lineman print, Hardy Boy books, feed bags, hand stitched applique quilt from St. Mary of the Knobs raffle, reproduction art glass lamps, Brinkhaus & Block Louisville KY flat top trunk and others, Coca Cola glasses, Christmas glasses, ashtrays, records, silverware, Stanley thermoses, Kingston guitar, violin, fur coat, perfume bottles, china dolls, vintage Star Wars posters, large insulators, Carrom game board, bottle capper, vintage mens 10-speed bike, leather motorcycle vests with patches and pins, single trees, hames and more. King size iron & wood 3-piece bedroom suite, double leather recliner theatre seat, combo electric fireplace/TV cabinet, bourbon barrel table, 1920’s side board, 1970’s dresser & chest, glass top dinette set, roll top desk, secretary desk, waterfall dresser, bowfront china cabinet, rolling butcher block kitchen island cart, quilt rack, industrial metal chair, vintage tool bench, wooden swing and more. LG front load washer & dryer, upright apartment size freezer, 55” smart TV, Dyson DC25 vacuum, Whirlpool deep freeze, Kenmore dehumidifier, Kenmore Elite stainless gas grill and small common household appliances. (2) Spiderlite TD6 studio lights, Canon EOS3, Canon EOS ElanII E, & (2) Canon AE-1 35mm cameras, vintage Polaroid 250 camera w/ flash, Anscoflex II camera, Canon 480 E6 speedlite flash, photography backdrops, film enlargers, multiple lenses, filters and more. Roosevelt tabletop popcorn machine, rooster collection, motorcycle figurines, Sesame Street cookie jar, pots, pans, kitchenwares, The Pampered Chef cookie press, glassware, Sierra Designs sleeping bag, linens, computer printer, metal shelving, elliptical machine, luggage, modern decor lamps and more. I-265 to Grant Line Road Exit#3. North 4/10 mile to left on Hausfeldt Lane. 1 mile to right on Green Valley Road. North 2 miles on Moser Knob Road to right on N. Skyline Drive. 9/10 mile to auction on right.